At Amazon, we live and breathe our Leadership Principles. This year, we introduced a new Leadership Principle: Learn and Be Curious. Leaders are never done learning and always seek to improve themselves. I’ve been encouraging my two teams to really take some time to think about how they want to execute on this principle by either taking on a goal (we are very goal-oriented at Amazon) that they will work on individually (outside of Scrum) or, use this goal to drive new innovation and opportunity within our platform within our Scrum team. For the former approach, I asked each team member that has presented a Learn and Be Curious (L&BC) goal to me to back out the time they want to invest from our Sprint capacity. For example, if the Sprint capacity is usually 220 hours, and two team members are working on a L&BC goal, our capacity is adjusted to 180 hours to provide both engineers 20 hours across 3 weeks to deliver on their personal L&BC goal. Early on in the Sprint, I noticed that the burn down was trending nicely (we use the burn down as just one of many information radiators on my team). Then I noticed a sharp dip over about 3 days which is not unusual for this team. About a week in, the sharp dip continued so I asked about the burn down at the end of stand up one morning wondering if they needed more work. On the contrary! The team had self organized to ensure that they had enough time to work on their L&BC goals without having to be randomized between the core Sprint work and the L&BC work. This way, with the Sprint goals well in sight, they could take much of the last week to work on their L&BC without having to task switch between Sprint work and their personal goal work. When you have the privilege of leading a high performing team, they will self organize to optimize for the most efficient and friction free outcome. As a leader, it is important that you have the right metrics and data to ensure that you can audit as needed and ask the right questions. But, most importantly, stay out of their way and let them do what they do best. 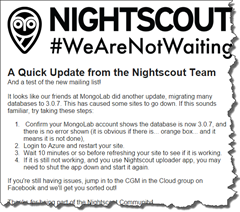 The great folks at Nightscout recently published an update to members/subscribers regarding another breaking Mongolabs change. In a nutshell, recently, Mongolabs updated their MongoDb database to 3.0.7 which appears to be breaking Nightscout and other clients. My guess is that the fix recommended below ensures any pooled and or unauthenticated connections are released, but I haven’t dug deeper to verify. 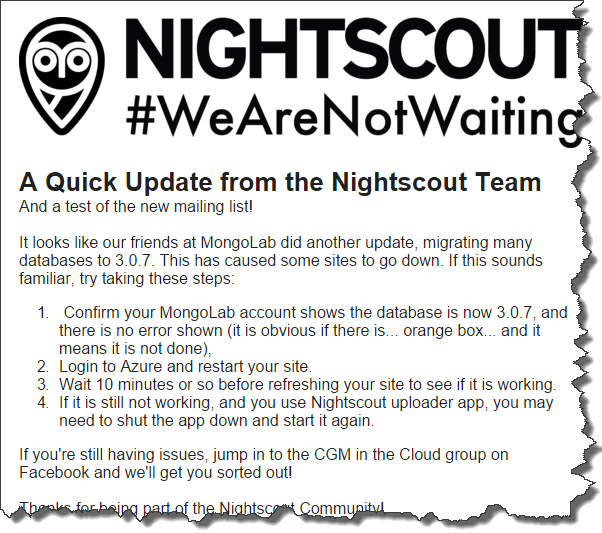 If you host your Nightscout Website or Bridge on Heroku, keep reading. My intent in this post is to provide a simple way to restart your app without a lot of technical experience required. 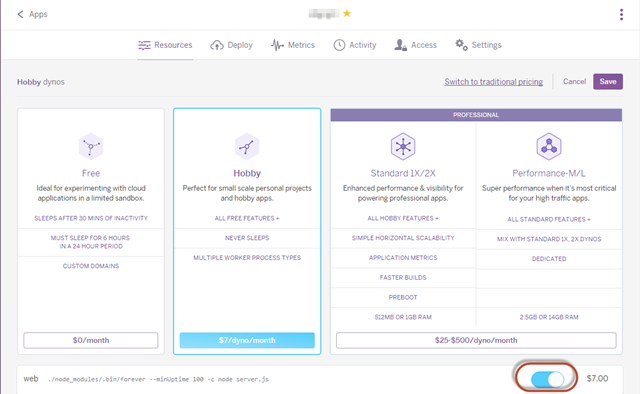 If you are hosting the Nightscout Website or Nightscout Bridge on Heroku, you may stumble to figure out how to ‘restart’ the apps, called “Dynamos” (Step 2 on the right). 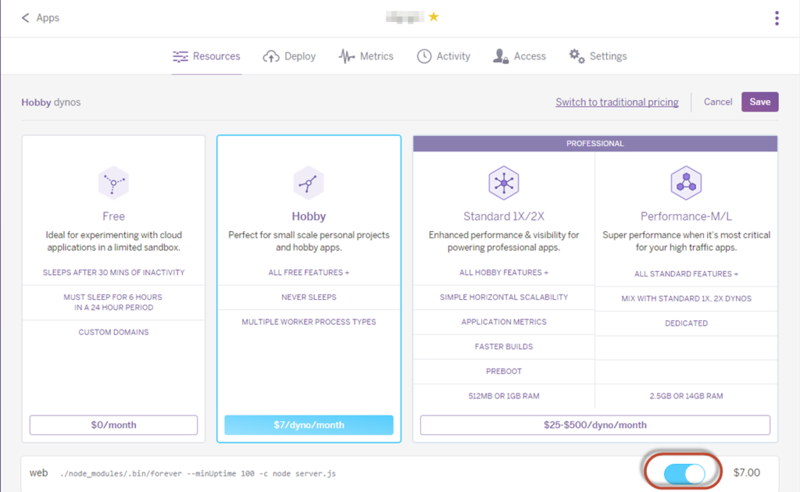 On Microsoft Azure, it’s very simple to restart an Azure Website but Heroku is a bit more subtle. A few Google searches reveals the heroku restart command line command, but I doubt most NightScout users are going to take the time to download client SDKs, set up Procfiles, etc. and there does not appear to be any documented way to restart a Dyno from the UI/Dashboard. 1. Click on your Dyno (i.e. this will be the app that is either running your Website or Bridge) to bring up the setting page. 4. Be sure to hit Save. 5. Repeat Steps 2 and 3, turn the Dyno back on and hit Save. Note, I did not have to wait 10 minutes for the fix to take effect. You should be able to refresh your website and it should work. In 1999, I started my career in software development as kind of an accident. Just out of the Army I was hired by First USA Bank (now JP Morgan Chase) to answer phones for their burgeoning customer service center in Austin, TX. The job paid $10.40 an hour, providing additional income to help cover what little the very generous GI Bill didn’t. Together, it was enough to cover full tuition at St. Edward’s University, rent for a one bedroom apartment and live and eat pretty comfortably for being 24. About 3 months into my job as a Customer Service Representative, I was selected for a “special project”. These typically ran from anywhere from a couple of weeks to a couple months and were an opportunity to get off the phones for a bit and learn the business while doing fairly clerical work for busy managers. In this case, I had lucked out with an opportunity to work for the Operations Manager for the Austin site who had the then very progressive idea of putting his Ops manual in HTML so that his team could easily refer to it without having to flip through a big three ring binder. Through this process, I taught myself basic HTML and CSS and got really good with MS Word and Power Point. Thanks to him and a little bit of chutzpah on my part, I never answered another customer service call again. This project ignited a passion for writing code that JP Morgan Chase would continue to very generously fulfill for over four years. I learned VBA, Access Forms and graduated to Classic ASP (thank you Scott Mitchell) and SQL Server 7. I was doing BI (dynamic, hand coded reports using ASP 3.0) before the term existed for the credit card operations business which at the time was pretty innovative. So much so, that we had teams from American Express and Bank of America visit our team to learn how we were doing it. I also dabbled in DNA and COM+ while at the bank but thankfully realized that .NET was the path forward and got pretty good at full stack web development with ASP.NET. I built one of the company’s first intranet portals for the auto and home lending operations group on ASP.NET 1.1. From there, I moved on to DriveTime where I learned enterprise mobility, EAI and SOA working on a major fleet management system we built on Windows Mobile 5, .NET 2.0 and BizTalk Server from the ground up. I learned enough to become dangerous with BizTalk Sever 2004 from Todd Sussman (who we hired as a BizTalk consultant-Todd had just moved from Israel to join Neudesic) and Brian Loesgen’s “BizTalk Unleashed” book (pretty much the BizTalk bible at the time, maybe still). Within no time, my team and I were doing messaging and eventing work and designing orchestrations that talked to RPG programs running on the IBM iSeries as well as consuming C++ modules exposed as Web Services in a fleet management package called Maximus. I would soon scrap all of the ASMX and .NET Remoting services we’d written in favor of Indigo/WCF. Thanks to Juval Lowy’s incomparable books on the subject and patient mentoring, I got pretty good with WCF forming a bias for WCF and WF for messaging and workflow that I’d pretty much keep thereafter. By 2006 I was very deep in integration technologies and was regularly speaking at local user groups and code camps. Shortly after joining ESS (now IHS) as an Architect and PM later that year, I published my first paid article focused on EAI with BizTalk. I further honed my WCF skills by implementing automation and workflow features for ESS’ Essential Suite product. The company had an amazing work-life balance which allowed me to get more involved in the community but consequently resulted in some restlessness that invariably led me to follow Todd Sussman to Neudesic where I joined the Connected Systems Development (CSD) practice (I would end up running this practice as General Manager for over 3 years). Shortly after joining the company, I was awarded my first Microsoft MVP award in October 2007 as a Connected Systems Developer thanks to Tim Heuer who was kind enough to nominate me, Rod Paddock for giving me the visibility that being published provides, and ESS which had provided me with the flexibility to build some community capital over those 10 months. That was 8 years ago and I’ve been fortunate to somehow get renewed every year since. This internal and external alignment of focus has been highly synergistic to my career and Neudesic has provided a level of opportunity and exposure I would never have otherwise had. During my nearly eight years with the firm I’ve had the opportunity to work very closely with Microsoft and dozens and dozens of clients across multiple industries both as an in-the-trenches consultant as well as a strategic advisor. I’ve published several articles and whitepapers, published my first book, spoken at various events and conferences across the country and, most notably delivered numerous custom development and integration projects largely in the intelligent transportation and hospitality and gaming space. Some of the external work I’m most proud of includes delivering dramatic improvements to processing time for enrollments on PrePass.com from an average of 7 to 10 days to under 48 hours; reducing the costs of operating perimeter security for commercial trucking companies by leveraging in-vehicle RFID technology to automate gate operation; providing Angelinos with an automated parking solution that simplifies their daily work commute by helping to determine if they should drive or take public transportation; enabling marketing, entertainment and Food & Beverage leaders to promote on-property amenities including events, retail and dining offers directly to players on slot machines resulting in The Cosmopolitan Hotel and Casino making history as the first property to open with the ability to deliver real-time offers and fulfillment to players during a live gaming session; and most recently helping Turning Stone Resort & Casino become smarter than ever when it comes to understanding their guest’s preferences and proactively anticipating their guest needs. Internally, I had the opportunity to implement a number of processes, frameworks and solutions I’m very proud of as well (I think its Martin Fowler that once said that focusing internally can sometimes be as or more rewarding than external work). I implemented the Engineering Excellence program which provides standards and guidance for addressing the development aspects of an agile team like continuous integration and delivery and rolled out 3 releases of content and guidance serving as Editor in Chief. I also led the creation of standardized technical marketing enablement assets as Group Program Manager leading a team of highly capable Capability PMs who delivered strategy maps, decks and other content. I owned and led the GTM for one of the first Neudesic solutions, Real Time Experience (RTX) which culminates almost 7 years of knowledge, experience, IP and assets delivering real-time messaging solutions for the hospitality and gaming industry and have taken a handful of customers live. This year, I incubated the Internet of Things (IoT) practice, working very closely with our internal teams and super smart people at Microsoft like Clemens Vasters and Dan Rasanova on the engineering side of things as well as key folks in the Microsoft business and field teams to become a key go-to partner for Microsoft IoT. This is really just a small glimpse of the amazing time I’ve had at Neudesic. A big part of what makes Neudesic an amazing company is the people. Everyone always says that working at Neudesic exposes you to some of the smartest people in the industry and it is absolutely true. I’ve learned so much during my time at this great company but the accomplishment I treasure the most is the relationships and friendships I’ve made through the years, a list too long to put here but you all know who you are. That said, I could not end this post without thanking Mickey Williams, my boss, mentor and friend who championed me early on and made my time at Neudesic that much more impactful, fun and rewarding. So as you can probably sense, while I never worked directly for Microsoft, working for Neudesic is about as close as you can get… I’ve served the Microsoft field team as a Virtual Technical Solutions Specialist for most of my Neudesic career and in addition to being an MVP have been an advisor to Microsoft engineering and business groups as a member of various advisory groups along with serving as a member of the Microsoft Partner Advisory Council for the last three years. Clearly, this is a career that Microsoft built. Microsoft has been very, very good to me for the last 14+ years. But change is inevitable. There are a number of things that attracted me to Amazon. In addition to being a very happy, satisfied Amazon.com customer for over a decade, for a distributed systems guy, a company who’s CEO effectively mandates SOA as the lingua franca for all teams internally is pretty cool. In addition, in doing a ton of research and speaking with good friends that work at Amazon, Amazon is very big on ownership and entrepreneurism, is highly customer obsessed, big on accountability, autonomy and greatly encourages big ideas to name just a few of their leadership principles that really resonate with me. I’ve had the opportunity to join engineering teams for other big companies like Microsoft in the past, but one thing that always got in the way was relocation. 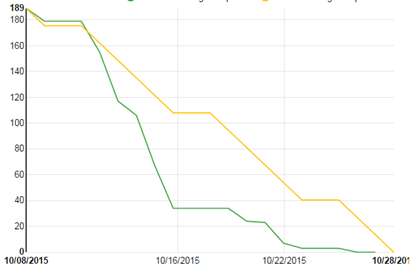 Sure, there are field roles out there but I’ve never been one to be motivated by a sales influence quota/scorecard. I like Seattle, but almost ten years ago my wife and I decided that Phoenix is home until the kids are out of high school and that’s a promise not to be broken. So, Amazon’s distributed engineering team model is a highly differentiating factor. In fact, other than planning meetings in Seattle and some potential trips to Detroit (another Amazon dev center), I will be home more than I’ve been in nearly a decade (though admittedly losing A-List and Silver status and my wife’s SWA companion pass will be tough to give up!). In terms of role, I will be working in the Marketplace business which has a dev center right here in Tempe (it’s actually less than a mile from my old office). The Marketplace business is a key part of Amazon.com’s price, availability and selection strategy and is one of the largest revenue producers in the company. I will be leading a team of Software Development Engineers (SDEs) focused on the distributed platform that powers the 3rd party seller experience on Amazon.com. This includes the experience you or I might have adding a widget for sale in Seller Central to big sellers uploading hundreds and thousands of transactions. And though it might be amusing to see how a Microsoft nerd adjusts to Linux, Java, Oracle and AWS, I am super excited to be doing something completely new and learning a brand new business and technical domain at a scale that I’ve likely never worked on before! As for community, I fully intend to continue to blog, write and speak. I may change up the technology focus a bit (and my cadence may slow as I ramp up at Amazon) but my passion for community, software development, teaching and mentoring will always remain. Some of you may be aware that my 9 year old daughter was diagnosed with Type 1 Diabetes last year. To say that the time since has been an emotional roller coaster would be a gross understatement but thankfully she is doing great and adjusting really well. While huge strides have been made in the treatment of T1D, one of the main things that the disease steals from you and your family is time and peace of mind. Finger pricks, injections, treating lows all occupy time away from living a regular life. What most people don't know is that with type 1, going low (i.e. blood sugar dropping) is far more dangerous that being high. When you have type 1 diabetes, your body doesn't produce insulin so you have one choice: Add insulin via injections or die. Pretty much that simple. The irony is that while we can't live without insulin due to its critical role of delivering energy (sugar) to our cells for normal brain and bodily functions, too much insulin can also kill you because it is incredibly efficient at delivering the sugar in your bloodstream to hungry cells (or fat storage if they’re well topped off). Without sugar (glucose to precise) your body, starting with your brain, literally shuts down. But too much sugar in the blood stream (which someone with T1D will always have without supplemental insulin) causes damage to organs and over time can lead to impaired eyesight, nerve damage and a host of other issues. So the key is to maintain a balance of external sugars (carbs) and insulin since your body (specifically, your pancreas) is unable to do so. The problem is that we make crummy substitutes for doing the important work of the pancreas. The result is life that feels like your constantly walking a tightrope where one miscalculation in the amount of insulin administered could quickly turn into an emergency situation. Most families are very good at detecting the symptoms of hypoglycemia. Irritability, perspiration, nervous shakes and confusion are common indicators that someone with T1D is “going low” and so far my daughter has been really good about detecting these symptoms by staying in tune with her body and her feelings and being super responsible about her tests. We are extraordinarily fortunate to have an amazing care team including teachers, nurses and faculty at school, dance instructors, piano teachers and relatives who have learned the symptoms and can act in the event my daughter doesn’t realize she’s going low (sudden confusion is a common symptom). Maintaining this balance is especially frightening at night during sleep because it is possible to go low without recognizing the symptoms (the person is peacefully sleeping) and the family and care team are also asleep. Far too many children, young adults and grow ups have sadly died in their sleep because they didn’t realize they were going low and before they could medicate- as simple as drinking a juice box or eating a snack size pack of Skittles- its too late. The cure for parents of children with T1D is to set the alarm clock for 2 or 3 AM (a new routine in my home) and do a test to ensure that if she is low we can get her back up. 9.9 times out of 10 she is fine, right within range but we have had a couple of near lows. This is especially important on high exercise days like dance or running club because the body consumes more sugar (energy) during times of peak activity that can sometimes gradually bring sugar surplus down. In the event that someone with T1D is very high in the middle of the night (again, despite the utmost care, unlike the perfect pancreas and liver team, we can and will make mistakes in calculations) he or she must take insulin to bring the blood sugar down to non-damaging normal range, and that means a pretty awful, sleepless night with more finger pricks. As you can imagine, this is not fun for the someone living with T1D or their parents or caretakers, but the choice of giving up a full night’s sleep and bothering your little one with yet another finger prick is an easy trade off when the stakes are this high. Fortunately, about twice a decade new innovation triumphs over the very high FDA bar to deliver new technology that makes living with Type 1 Diabetes a little easier. Examples include the advent of insulin pens with nano-needles over larger, clunky and more painful injections, home glucose testing kits over relying on highly inaccurate urine tests, or worse monthly visits to your doctor for lab work and insulin pumps that administer micro doses of insulin and do a far better job of playing pancreas than we humans can. One such recent breakthrough has been in bringing continuous glucose monitoring (CGM) to the market. CGMs work by inserting a small needle exposed from a sensor about the size of a postage stamp (but much thicker) into the subcutaneous tissue and reading the current blood sugar in the blood stream at a given interval. The sensor then transmits the reading to a receiver about the size of a cell phone for display. 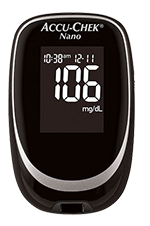 While finger pricks are still required from time to time for calibration purposes, a CGM is a huge improvement to the quality of life of someone living with T1D and their care team because it not only provides the blood sugar information much more frequently, but given the frequency can also report on data trend. This is incredibly helpful in knowing if blood sugar is flat (good), rising (not good) or falling (really not good). For example, if a person with T1D is about to play in a tennis match and is within range but trending down, this data is enough to provide the insight to eat an apple or other healthy snack before the game. 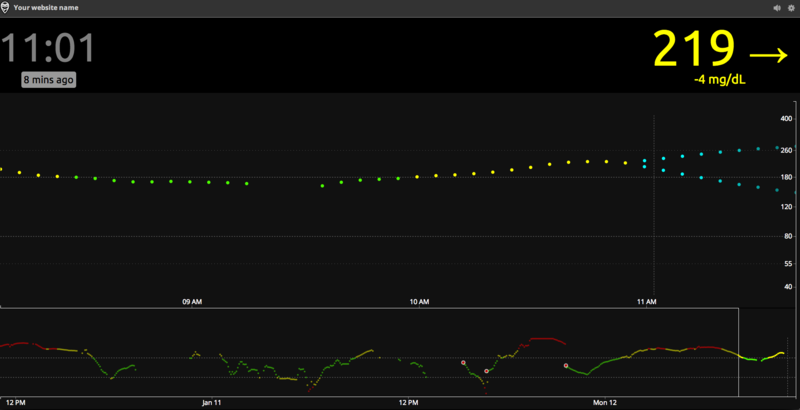 Likewise if after a celebratory pizza party blood sugar is still continuing to rise after administering X units of insulin, a corrective dose can be administered without missing it and going high for an afternoon. So while CGMs are an amazing advancement in the treatment of T1D, alone they are not a panacea because while you still benefit from much more information much more frequently you still have to be awake to benefit from the data. Some devices (such as the Dexcom G4 Platinum) provide the ability to set hypo (low) and hyper (high) alarms which is a great step forward but snoozing through an alarm clock is something we’ve all experienced so still a risk. In addition, the information is isolated within the device and visible only to someone near the device. This is where the work of amazing community that is the Nightscout Project comes in. The project is comprised of a 100% volunteer group of DIYers, all with day jobs who together are learning and sharing new ways to expose this critical data in a way that increases visibility and awareness for the entire care team. You can learn more about this great project here but in a nutshell, the project provides a reference architecture, guidance and code to stream this precious telemetry up to the Microsoft Azure cloud. The idea is that once the data is unshackled from the stand alone device, it can be shared openly. Imagine the peace of mind this brings to a parent who is wondering if his or her child got enough carbs before recess and with one click see a dashboard with live updates 5 minutes apart. The dashboard running on Azure Websites. That’s game changing in and of itself. But that’s really only the beginning. Once the data is landing on Azure, you are free to do with it what you want. This is where leveraging APIs for email or SMS come in. How nice would it be to get automatic updates anytime your child’s blood sugar is trending up or down, or be able to display the current blood sugar on a smart watch giving your child back just a little bit of dignity and freedom to just live life a little more care free like any kid should be able to? On Thursday, January 22nd, The JDRF Orange County Chapter, The Nightscout Project and Microsoft are teaming up for a 4 hour educational event to explore the latest state of the art of managing diabetes on the cloud followed by a hand-on workshop to help several families get up and running with the Nightscout kit. You can learn more and or register about the event here. I will be attending the event to learn all I can and provide any technical support I can offer in the workshop though this is the first time I’ll be seeing the build myself. My goal is bring this event to Phoenix this year and I’m currently in conversations with JDRF, Microsoft and Nightscout leadership so stay tuned (I also got a soft commitment for the keynote from a highly prominent A-Lister that I promise any nerd will won’t want to miss wither you’ve been touched by T1D or not). I’d like to thank Ali Mazaheri and Katie Ryckman at Microsoft, Michelle Popoff at JDRF and Wes Ton of the Nightscout project for brining this event to Orange County and allowing me to participate. Last but not least, I’d like to thank Scott Hanselman for connecting me with the Nightscout project and teaching me that true community extends far beyond a platform or technology. As you can tell, I’m pretty passionate about this project and you’ll be hearing from me a lot more (as well as hopefully seeing some commits from me on Github). We didn’t ask for Type 1 Diabetes, and trust me, I’d give anything for God to take it back but I feel uniquely blessed to have the opportunity to be a part of this. As a father of the most amazing daughter in the world (who just happens to have T1D), being a Microsoft Azure MVP coupled with my interest in IoT gives me an amazing opportunity to apply my talents and interests for a greater good. Hopefully I can make a small difference. Long overdue, here are my slides from VS Live DC last month. I plan on getting my demos up on Gitbub and will update this post when I do. Secure, federated identity. A durable, reliable and scalable backend. Scalable messaging fabrics that unlock assets both in the cloud and behind the firewall. All of these are table stakes when delivering modern mobile enterprise applications. Whether you are building responsive web apps for devices or targeting iOS, Android, Windows Phone or Windows Store apps, as a mobile developer, you must focus on delivering a beautiful and functional user experience if you want your apps to be adopted. What if you could have all of this plus the power or Visual Studio 2013 and Windows Azure? Well, now you can! Instead of reinventing the wheel each and every time you need to target a new device platform, learn how Visual Studio 2013 and Xamarin allow you to target iOS, Android and Windows devices while promoting reuse of code assets across platforms. And when you're done with the front–end work and are ready to wire up your mobile app, come see how Microsoft Azure Mobile Services provides a simplified stack that tackles security, durability, reliability and modern messaging all with just a few lines of code. In this session, you'll learn how you can harness the power of Visual Studio 2013 with the flexibility of Xamarin and the power of Microsoft Azure Mobile Services to tackle all of your cross platform and back end chores quickly and easily so you can focus on what your users really care about. Microsoft Azure BizTalk Services is a new breed of PaaS middleware capabilities (iPaaS) for building a new generation of applications and solutions that extend beyond the traditional business, network and security boundaries of the enterprise. More than just messaging, MABS delivers robust routing, transformation, mediation and enrichment capabilities to your hybrid applications enabling a whole new generation of connectivity across the enterprise, devices and clouds. In this session, we'll wire up a responsive mobile web app to a back-end application residing behind the firewall using a low friction, RESTful approach. We'll cover how to map from your application domain to other system, application APIs and options for pushing data to multiple destinations including Microsoft Azure, Web Services, and FTP. You will learn how MABS can take the pain out of sharing information behind the firewall, support many of the rich mapping capabilities you've come to expect from BizTalk making integration with 3rd party service providers and assets behind the firewall a breeze. I covered a ton of content in just over 60 minutes including a command demo with a Fez Spider board and Azure Service Bus and a sneak peak of Azure Device Gateway (code-name Reykjavik) deployment on my Azure subscription to demonstrate deployment, telemetry, inquires and commands with a software emulator. Thank you Redmond, 1105 Media, Microsoft, fellow speakers and all attendees for a great show. I had a blast! 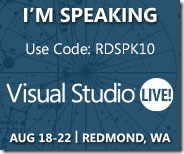 I’m thrilled to be speaking at VS Live Redmond next week. The show starts on Monday August 18th and goes through Thursday the 21st on Microsoft campus in Redmond, WA. Events in Redmond a re always a special treat as it gives everyone a chance to see the campus, interact with product team members and as always, meet and hang out with some of the best, most recognized speakers in the industry like Ted Neward, Michael Collier, Brian Noyes, Eric Boyd, Rachel Appel, Miguel Castro, Rocky Lhotka, Andrew Brust- the list goes on. I’ll be delivering two Azure focused presentations on the Internet of Things and API development with NodeJS. Since there is only so much space available for the abstracts themselves, I thought I’d elaborate a bit on what you can expect from each session in this short post. You can find more details about both talks on the VS Live Redmond website or go directly to the abstracts by following the links below. In this talk, I lay the foundation for IoT and why you, as a developer should care. I’ll show off a handful of devices ranging from Arduino, Netduino and Fez Spider and demonstrate a number of common patterns currently in the wild including default communication, brokered and service assisted. We’ll explore the challenges that exist today in supporting commands, notifications, inquiries and telemetry. I’ll then spend some time giving you an in-depth tour of Reykjavik, Microsoft’s code name for its reference architecture focused on delivering highly scalable messaging fabrics for modern IoT solutions. We’ll take a look at the reference architecture and how it maps to components on Microsoft Azure. I’ll then demonstrate what a first-class Reykjavik device looks like and demonstrate live telemetry and commands for an end-to-end tour of Reykjavik. I’ve been spending a lot of time with Clemens and team over the last several weeks so this promises to be an inside look at the reference architecture and general shape of things you're unlikely to find publically anywhere else. This is a talk that I’ve been working on for several months now and continues to evolve. As I discuss in my latest article in CODE Magazine, it started off as a spike for teaching myself basic NodeJS and kind of evolved into a little project for work that needed a hosting environment. After exploring various options, Azure Websites made the most sense and this talk focuses on the key features and functionality of a little URL shortening API along with key ALM considerations like IDE, unit testing, continuous integration and deployment. If you plan on attending either of my sessions please stop by and say hi or after the talk. I hope to see you there! Although there are many options for hosting NodeJS applications, Microsoft has been an early supporter of NodeJS from the beginning by making direct investments in the framework and demonstrating a commitment to making NodeJS a first class citizen on Windows, both on-premises and on Microsoft Azure. In my new article for CODE Magazine, I provide a lap around NodeJS and Microsoft Azure Websites by showing you a simple but functional API that I recently developed from the ground up. I’ll start by discussing the design of the API, go on to reviewing implementation details, and then proceed to pushing the API live on Microsoft Azure Websites. You can read the article here as well as on Amazon and at your local news stand.